The inspiration for this project came from a visit by Madison Mayor Susan Bauman’s Arcatao, El Salvador, one of Madison’s Sister Cities, in the fall of 1998. While she was in El Salvador she met with many women’s organizations. The women in these organizations talked with her about the difficult issues they were working on such as the sweat shops in El Salvador where so many women work and are exploited. These women also told Mayor Bauman about the loan fund projects they were trying to implement but were having difficulty establishing them. 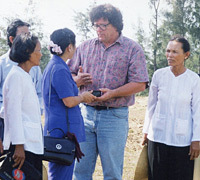 It was suggested to Mayor Bauman that a visit by the women of My Lai might be helpful to the women of El Salvador since the loan fund programs we have established in My Lai and elsewhere have been very successful. She agreed with this suggestion and when she returned to Madison her staff contacted Mike Boehm because of his relationship with the Vietnam Women’s Union and their success together in funding and facilitating loan funds in Quang Ngai province. 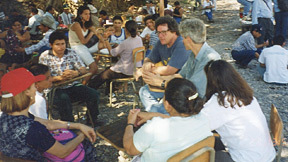 In January, 2000, Mike was sent to El Salvador on behalf of the newly created Sisters Meeting Sisters project where he met with many women’s organizations. Each time he met with the different groups of women in El Salvador he would present them this new project as an idea only. The women of El Salvador reacted very emotionally to this idea. All of the women he met in El Salvador are former guerillas. All of the guerilla forces in El Salvador, Nicaragua and Guatemala look up to and admire the people of Vietnam for having won their revolution. He was told by the El Salvadoran women that just meeting the women of Vietnam will help revitalize their organizations. During the year following his first visit to El Salvador, the women of Vietnam and the women of El Salvador exchanged a series of very powerful letters (which MQI translated from Vietnamese to English to Spanish and back again) in which they called upon the women of the world to unite to end the fratricide of war. During Mike's many meetings with women’s organizations there the women enthusiastically opened their hearts to this opportunity. They have tremendous respect for the people of Vietnam and said they want to discuss a number of issues with the women of Vietnam: globalization, privatization, domestic violence and more. However, the issue most of these women came back to over and over was healing wounds of war. Mike was asked many times if the women of Vietnam have ways of healing that could help the women of El Salvador. The wounds cut so deeply in the women of El Salvador, as they do all over the world whose lives have been devastated by war that these women have lost the ability to dream or hope. This project is not currently active. Mike Boehm listens to the testimony of the massacre these women from El Salvador survived. March 16, 2001. Mike Boehm hands over the rock given to him by the women of El Salvador to give to the women of My Lai. One meeting illustrates the trauma the women of El Salvador are dealing with. We were invited to attend the monthly meeting of the 40 Presidents of the Directivas of the state of Chalatenango. Usually these meetings are held in each others villages, but this time the meeting was held under the over hanging trees on the dry riverbed of the Sumpul River. After the meeting, I was introduced to the six women who were presidents of their Directivas. We gathered in a circle, and I explained our proposed project to them, emphasizing that our role in Madison was only to fund and facilitate this project. We would follow the agenda set by the women of El Salvador and Viet Nam. Once again, this concept was eagerly embraced by the El Salvadoran women, and we discussed it at length. Then, as we sat in our circle on the riverbed under the trees, Esperanza began telling me what happened on this spot more than 10 years ago. El Salvadoran government troops had surrounded their village to begin one of the many massacres committed during that war. The villagers fled but were stopped by the Sumpul River. As they swam to the other side to escape, the government troops began firing, killing more than 600 men, women and children. One of Esperanza s surviving children, a boy of nine at the time, climbed the hill on the other side of the river to keep an eye on the government troops. He watched them become so physically tired from killing that they would hand their M-16s to other soldiers to continue the killing. Four of the six women sitting in this circle survived that massacre, and as Esperanza told this story, they sat there with tears welling from their eyes, their faces twisted in pain. Esperanza finished her telling of this story and said that she had given testimony about this massacre many places around the world, including the Vatican. But she said this was the first time she had given testimony of the massacre on the site itself. Tita then reached down to the riverbed and picked up a small rock and handed it to Esperanza. Esperanza brushed it off and handed it to me and said, "Please give this to the women of Viet Nam as a symbol of today s witness." So, today, March 16, the anniversary of the massacre at My Lai, I formally handed over the rock in its beautiful lacquer box to the women of My Lai. This simple rock, now a symbol of hope and the potential for healing, will be held in care of the Women s Union. When the My Lai Peace Park is completed and a small museum is built, the rock in its lacquer box will be placed on display there.